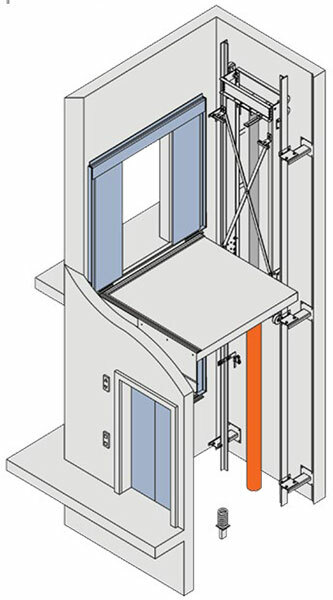 This application is used when a side opening is required in addition to a front opening. The rails and brackets are located on one wall of the hoistway. Please note that the dimensions shown are only examples of applications possible. Please call MEI for job-specific dimensions..
No jack hole is required. Accommodates front and side openings. 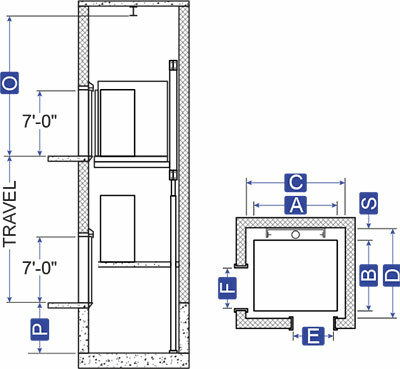 Minimum of 12′ -5″ overhead required for 11′ -0″ of travel and under. If over 11′ -0″ travel, overhead must be 18″ greater than total travel. Minimum of 13′ -3″ overhead required for 20′ of travel and under. Add 1/2” to 13′ -3″ for every additional 1″ of travel over 20′ -0″.